Every summer the Division of Wildlife's field officers must relocate and sometimes destroy habituated black bears because people living or camping in bear country often fail to take basic precautions and proactive measures to avoid conflicts. The Division's bear policy emphasizes providing the public with information on how to avoid a black bear encounter by removing all possible bear attractants, and uses trapping and relocation as infrequently as possible for bears that continue to pose a problem. Part of the Division's directive is to kill a problem bear the second time it is trapped - the so called "two strikes" of the policy. When wildlife managers are called to a home or campsite about a bear problem, they first look at what attracted the bear in the first place. If they notice trash, pet food, bird feeders, grease-encrusted barbecue grills or other lures, they explain what the homeowner or camper needs to do to prevent any future problems. Unless the bear is considered a threat to human safety, officers will generally not trap the bear until all trash and food are removed. 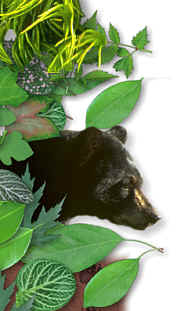 If the bear continues to pose a problem, wildlife officers will trap and relocate the bear as a second to last resort. Trapping and moving bears also takes a lot of time and is an expensive process. Relocating a bear is not always successful because of the animal's ability to travel long distances. "A high percentage of bears will go right back to the area that they were trapped and become an even bigger problem," said Melody Miller, district wildlife manager in west Durango. "It's difficult to break a bear of the habit of going after bird seed, garbage and other bear attractants," Miller said. "Once a bear becomes addicted, it will keep going after that easy food source." she said. Also, if we have to relocate a problem bear, depending on the area, the animal's chance of surviving decreases," Miller said. Bears that are relocated are often placed in another bear's territory. This can create competition for food and another bear's territory, which could lead to the bear being chased off or killed by another bear that inhabits the area, Miller explained. When a wildlife officer is called upon to trap a bear that persists to be a problem, and for the second time, the Division's policy is to destroy the animal. "As wildlife officers we don't like to have to kill the animal," said Pat Tucker, area wildlife manager in Glenwood Springs. "People cause the deaths of these animals by not changing their behavior and habits. In most cases, it's up to them to keep bears out of trouble and thus from having to be destroyed." he said. • Stay calm. If you see a bear and it hasn't seen you, calmly leave the area. As you move away, talk aloud to let the bear discover your presence. • Stop. Back away slowly while facing the bear. Avoid direct eye contact as bears may perceive this as a threat. Give the bear plenty of room to escape. Wild bears rarely attack people unless they feel threatened or provoked. • Speak Softly. This may reassure the bear that no harm is meant to it. Try to show no fear. • Coming between a female and her cubs can be dangerous. If a cub is nearby, try to move away from it. • Be alert - other cubs may be in the area. • Fight back if a black bear attacks you. Black bears have been driven away when people have fought back with rocks, sticks, binoculars and even their bare hands.